As neither of us had been raised on a farm, we needed to learn the ropes. We went on farm tours and stumbled into a very small, local, organic farming group. Although that group disintegrated, as sometimes happens, it was later resurrected as a new chapter of NOFA (now known as the Northeast Organic Farming Association). In exploring how to farm, we learned the difference between commercial and sustainable agriculture. Commercial agriculture values mechanization. It focuses on the attractiveness of the product, and employs practices, such as mono-cropping, that mimic mass production. Routine pesticide applications deal with “the bugs,” and routine herbicides ensure that only the desired plant grows in the straight row so that a machine can harvest it. These assembly-line practices intentionally interfere with Nature and damage ecology. 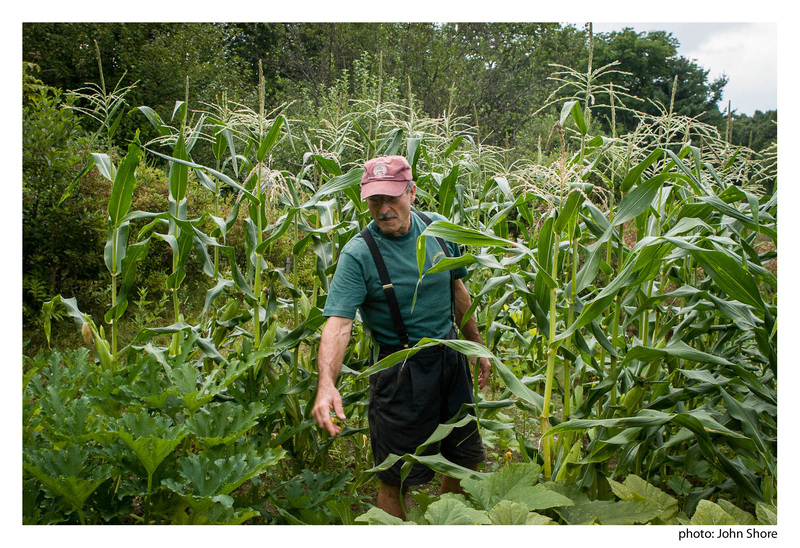 Sustainable farmers and gardeners partner with Mother Nature to co-create food. Whatever its official name, sustainable agriculture models its practices on the way Nature grows food and focuses on promoting the health of the soil. These practices include applying compost to the soil and inter-planting crops to assist Nature’s complex and delicate balancing process. Healthy soil grows healthy plants that are less prone to bugs. Healthy plants grow healthy people – less prone to bugs. While I’ve necessarily simplified these differences, sustainable agriculture supports the health of our planet and those who live here, providing optimum nourishment for our bodies. When we started farming thirty years ago, very few people cared about sustainable agriculture, or thought about how their food was grown. It was impossible to find organically grown produce, whole grains, and minimally processed food anywhere other than small health food stores. In order to buy health promoting food for my family, I needed to travel from Medfield to Brookline. Much has happened during these interim years. Gradually, more people began to understand the importance of “organically” grown. And as people’s awareness shifted, so did their shopping habits. I wasn’t the only one requesting that my local supermarket offer healthier food. And as this happened, the demand for “organic” increased. Change happened! Change is a process, and swings in one direction generate reactions throughout the system. As the demand for “organic” increased, Big Business Agriculture wanted a piece of the pie. They saw a market opportunity. And when our government decided to legislate the term “organic,” Big Business Agriculture lobbied to dilute the requirements for the “organic” label. When the first federal standards for “organic” became public knowledge, many of the practices they approved were downright unhealthy – for the soil, for our planet, for ourselves. NOFA, and other grass roots organizations, raised their voices demanding that these regulations be revised. And they were! Not as much as we would have liked, but, again, change happened. Despite these important changes, much has remained the same. Big Business continues to control how most of our food is “grown.” Their food production practices deplete the soil and contaminate our planet. Big Business also controls the seeds. Seeds contain the food of our future. Most of our food seeds have been commercially “created” – hybridized versions of a wild plant. While many of these hybrids have beneficial properties, farmers and gardeners have become dependent on Big Business for their seeds. To make matters worse, we now have genetically modified seeds (GMOs) invading our fields with the potential of causing havoc in Nature’s domain. Unless we address the underlying issues – the deeper roots of our food “system” – truly nourishing food will cease to exist! The deeper problem, as I see it, is that our society no longer values Nature, but looks to control and suppress her. We aim to control Nature, exert power over her, and bend her to our will. Instead of experiencing ourselves as interdependent with Nature, we separate and dissociate ourselves from the natural world. Our buildings are “climate controlled,” heated in summer and air-conditioned in winter. When not inside buildings, we travel in moveable environments called automobiles and airplanes – unaffected by the weather or the limitations of our human bodies. We eat “fast food” that is mass produced, then wrapped in plastic. The perfectly round, packaged tomatoes on our grocery shelves no longer taste like real tomatoes. They were bred to look pretty and survive being shipped cross country. Our food has become a commodity, no longer recognized, or appreciated, as being a gift from Nature. We need to shift our relationship with Nature from one of “power over,” to one of “power with.” And we, the People, must take our food power back from Big Business Agriculture and align ourselves with Nature. This starts with changing the way we eat and think about food. Support your local farmer, join a CSA, shop at farm stands and farmers markets. Realize that small farms can’t afford the fees for organic certification, yet often adhere to sustainable practices. Locally grown food is not only fresher, but also inherently more nourishing to our bodies. Real food isn’t cheap; it’s grown with love and hard work. Vote with your wallet by spending money on sustainably grown food that will help heal and replenish Earth, as well as nourish your body. If possible, grow some of your family’s food. When you plant seeds and foster their growth, you develop relationships, not only with the plants and the food they so generously provide, but also with our Earth. If you don’t have a backyard, you can grow a few herbs on the windowsill, or tomatoes in pots. Eat wild food whenever you can — the food that Nature intended us to eat. Teach your children to eat and appreciate real food. Take them into the garden and teach them how food is grown. Invite them to plant the seeds, water the plants and harvest the fruit. Be aware of needing to give back to the earth, to nourish the soil for future food. On Harmony Farm we compost manure from our animals along with kitchen scraps and put it into our garden. When compost is returned to the Earth, it re-vitalizes and re-energizes the soil for future growing. Help grow awareness. Wherever you shop, inquire as to where the food was grown. Was it grown locally? And how was it grown? Did they use sustainable practices? Experience yourself as part of Nature, your life interwoven with hers. When you sit at your table preparing to eat, thank Mother Nature for her gift of nourishing food. Note: This piece, written by Lesley Irene Shore, Ph.D., was originally published in Spirit of Change Magazine, Spring 2012.